As we age, the tiniest blood vessels in our bodies become damaged, wither and die, and our arteries harden and become less pliable. When this happens the blood flow to organs and tissues is reduced, leading the way to many diseases – cardiovascular, neurological, muscle-wasting frailty and even aging itself. Three studies published in 2018 all show that several cardiovascular diseases stemming from vascular aging can be reversed by stimulating the activation of a group of proteins known as sirtuins. These sirtuins are activated by boosting a molecule called NAD+ through another precursor molecule called NMN ((nicotinamide mononucleotide) that is ingested as a supplement. Let’s review each of the three studies to see how NMN was tested to improve NAD+ and sirtuins, potentially resulting in the repair of damaged blood vessels. A study lead by Dr. David Sinclair’s lab at Harvard Medical School and published in March 2018showed that the vascular aging process can be reversed in mice, setting the stage for radical new therapies to help people age better. This study has unraveled the cascade of interactions between blood vessels and muscles. Endothelial cells, which line the walls of blood vessels, are essential for the health and growth of the blood vessels. As endothelial cells age, blood vessels get damaged, begin to atrophy and die, blood flow to many parts of the body diminishes, organs and tissues begin to function poorly. Damaged blood vessels hit muscles especially hard because muscles rely on a robust supply of blood for their function. Blood vessel atrophy can be slowed down with regular exercise, but not eliminated. At some point, even exercise fails to stave off damaged blood vessels and muscle loss. What was learned in this study was how aged and damaged blood vessels become deaf to the signals from exercise muscle. This actually leads to these muscles shrinking as we get older. We then are less able to exercise and grow new blood vessels. The two key players in the crosstalk between blood vessels and muscles are a molecule called NAD+ and a protein called SIRT1 (or sirtuin 1). NAD+ boosts SERT1, which in turn enables the conversation between muscles and damaged blood vessels. In a series of experiments, the Harvard team found that reduced blood flow develops as endothelial cells start to lose a critical protein known as SIRT1. Previous studies have shown that SIRT1 delays aging and extends life in yeast, fruit flies and mice. SIRT1 loss is, in turn, precipitated by the loss of NAD+, a key regulator of protein interactions and DNA repair that was identified more than a century ago. Previous research by Sinclair and others has shown that NAD+, which also declines with age, boosts the activity of SIRT1. The problem is that both NAD+ and SIRT1 decline as we age, gradually becoming less capable of performing their role as the interface between the muscles and blood vessels. In the attempt to increase NAD+ and SIRT1, the researchers gave mice NMN, a chemical compound commonly found in the body and previously shown to boost NAD+ levels, which in turn augments SIRT1. These animals’ capacity for exercise improved dramatically – the old mice treated with NMN had up to 80% greater exercise capacity compared with mice not consuming NMN. Rewinding the clock on aging blood vesselsfrom Harvard Medical Schoolon Vimeo. Sinclair’s second study published in 2018 underscores his commitment to NMN. In September 2018, Drs. David Sinclair and Alice Kane published the results of a study they headed called, Sirtuins and NAD+in the Development and Treatment of Metabolic and Cardiovascular Diseases. The purpose of the study was to examine how the family of seven siturins found in mammals protects against a decline in vascular endothelial function, metabolic syndrome, ischemia-reperfusion injury, obesity, cardiomyopathy and dyslipidemia. The activation of sirtuins and NAD+ by consuming NMN was shown to improve all of these cardiovascular events, as well as improve insulin sensitivity, and other health benefits in a wide range of age-related cardiovascular and metabolic disease models. Again, as in other such studies, the increased NAD+ levels stimulated by NMN supplementation activated sirtuins. Specifically, this study demonstrated that SIRT1 in endothelial cells is a key mediator of signals by muscle cells (myocytes) that stimulate new blood vessel growth by pre-existing vessels (pro-angiogenic signals). Treatment of mice with the NAD+ precursor NMN improves blood flow and increases endurance in advanced aged mice by promoting SIRT1-dependent increases in capillary density, an effect augmented by exercise. Together, these findings have implications for improving blood flow to organs and tissues, increasing performance in aged individuals. It’s noteworthy that, as with all published studies on NMN, the three summarized here were not done on humans. Does that make their findings irrelevant to us? Heart.org: What Is Cardiomyopathy in Adults? The Jackson Laboratory: Why are mice considered excellent models for humans? Alice Park: This Compound Can Reverse Aging in Mice. Will It Work in People? Supplementation with Nicotinamide Mononucleotide (NMN) has preventive and therapeutic effects against age-associated functional decline and common ailments of aging. Even though science has improved our understanding of the progressive decline in function our bodies experience because of aging, there is not yet a clear mechanism that can explain why chronic diseases are an inherent part of the aging process. We expect to live longer lives, but our quality of life is affected by age-related diseases. The effects if NMN supplementation go beyond just the increased production of NAD+. Studies done in rodents have shown that NMN improves glucose tolerance in aging mice who developed diabetes because of high-sugar diets. These findings suggest similar effects might be possible in older humans who develop diabetes because of a poor diet. (3-8) Further studies have demonstrated the benefits of NMN supplementation for improving sugar metabolism as we age. NMN increases the production of insulin, when insulin-resistance has been caused by a high-fat diet. This is achieved by restoring adequate production of NAD+ and by reducing inflammation and stress caused by free radical damage, countering the effects of age-related chronic inflammation. (3) These studies have also shown that NMN reduces inflammation in fatty tissue, and improves sensitivity to insulin across several different organs. (9) Most importantly, these beneficial effects were found to be more effective in old age. Anti-aging research has shown that supplementation with NMN, a key NAD+ intermediate, is effective at mitigating age-associated metabolic decline and slowing the progression of a multitude of age-related diseases. NMN has beneficial effects on the production of energy at the cellular level, improves tolerance to glucose, reduces inflammation, helps preserve the circulatory system, repairs DNA, and has beneficial effects on the preservation of cognitive function. NMN has also shown potential as a therapeutic agent against Alzheimer’s disease and other neurodegenerative disorders typical of old age. Supplementation with NMN may be of benefit in preserving endurance and mobility. Preserving the functions of these diverse systems across the body promotes health and longevity and significantly improves quality of life as aging progresses. Canto, C., Menzies, K.J., and Auwerx, J. (2015). NAD(+) metabolism and the control of energy homeostasis: a balancing act between mitochondria and the nucleus. Cell Metab. 22, 31–53. Guan, Y., Wang, S.R., Huang, X.Z., Xie, Q.H., Xu, Y.Y., Shang, D., and Hao, C.M. (2017). Nicotinamide mononucleotide, an NAD+ precursor, rescues age-associated susceptibility to AKI in a sirtuin 1-dependent manner. J. Am. Soc. Nephrol. 28, 2337–2352. Yoshino, J., Mills, K.F., Yoon, M.J., and Imai, S. (2011). Nicotinamide mononucleotide, a key NAD(+) intermediate, treats the pathophysiology of diet- and age-induced diabetes in mice. Cell Metab. 14, 528–536. Peek, C.B., Affinati, A.H., Ramsey, K.M., Kuo, H.Y., Yu, W., Sena, L.A., Ilkayeva, O., Marcheva, B., Kobayashi, Y., Omura, C., et al. (2013). Circadian clock NAD+ cycle drives mitochondrial oxidative metabolism in mice. Science 342, 1243417. Gomes, A.P., Price, N.L., Ling, A.J., Moslehi, J.J., Montgomery, M.K., Rajman, L., White, J.P., Teodoro, J.S., Wrann, C.D., Hubbard, B.P., et al. (2013). Declining NAD(+) induces a pseudohypoxic state disrupting nuclear-mitochondrial communication during aging. Cell 155, 1624–1638. Lin, J.B., Kubota, S., Ban, N., Yoshida, M., Santeford, A., Sene, A., Nakamura, R., Zapata, N., Kubota, M., Tsubota, K., et al. (2016). NAMPT-mediated NAD (+) biosynthesis is essential for vision in mice. Cell Rep. 17, 69–85. de Picciotto, N.E., Gano, L.B., Johnson, L.C., Martens, C.R., Sindler, A.L., Mills, K.F., Imai, S., and Seals, D.R. (2016). Nicotinamide mononucleotide supplementation reverses vascular dysfunction and oxidative stress with aging in mice. Aging Cell 15, 522–530. Caton, P.W., Kieswich, J., Yaqoob, M.M., Holness, M.J., and Sugden, M.C. (2011). Nicotinamide mononucleotide protects against pro-inflammatory cytokine-mediate impairment of mouse islet function. Diabetologia 54, 3083–3092. Stromsdorfer, K.L., Yamaguchi, S., Yoon, M.J., Moseley, A.C., Franczyk, M.P., Kelly, S.C., Qi, N., Imai, S., and Yoshino, J. (2016). NAMPT-mediated NAD(+) biosynthesis in adipocytes regulates adipose tissue function and multi-organ insulin sensitivity in mice. Cell Rep. 16, 1851–1860. Stein, L.R., and Imai, S. (2014). Specific ablation of Nampt in adult neural stem cells recapitulates their functional defects during aging. EMBO J. 33,1321–1340. Yoon, M.J., Yoshida, M., Johnson, S., Takikawa, A., Usui, I., Tobe, K., Nakagawa, T., Yoshino, J., and Imai, S. (2015). SIRT1-mediated eNAMPT secretion from adipose tissue regulates hypothalamic NAD(+) and function in mice. Cell Metab. 21, 706–717. Wang, X., Zhang, Z.F., Zheng, G.H., Wang, A.M., Sun, C.H., Qin, S.P., Zhuang, J., Lu, J., Ma, D.F., and Zheng, Y.L. (2017). The inhibitory effects of purple sweet potato color on hepatic inflammation is associated with restoration of NAD(+) levels and attenuation of NLRP3 inflammasome activation in high-fat-diet-treated mice. Molecules 22, https://doi.or 3390/molecules22081315. Yao, Z., Yang, W., Gao, Z., and Jia, P. (2017). Nicotinamide mononucleotide inhibits JNK activation to reverse Alzheimer disease. Neurosci. Lett. 647, 133–140. Park, J.H., Long, A., Owens, K., and Kristian, T. (2016). Nicotinamide mononucleotide inhibits post-ischemic NAD(+) degradation and dramatically amelioratesbrain damage following global cerebral ischemia. Neurobiol. Dis. 95, 102–110. In your body, NMN is converted into a related compound called nicotinamide adenine dinucleotide (NAD), which is found in every cell of living organisms and is essential for life. NAD+ is crucial in fueling the seven different genes in our body that govern aging. These genes are called sirutins and are referred to as SIRT1-7. NAD+ is the sirtuin activator. The sirtuins are a family of proteins involved in regulating cellular processes including the aging and death of cells and their resistance to stress. Unfortunately, as we age and our NAD+ levels decline, so do our sirutins. Sirtuins are indispensable for DNA repair, controlling inflammation and antioxidative defense which makes them good anti-senescence/anti-aging targets. The vital importance of NMN in activating all of the seven sirtuins is a key explanation of the wide-ranging activity of this supplement. The sirtuins do not simply increase the numbers of mitochondria within the cell; they stimulate the death and destruction of damaged mitochondria and improve intercellular communication. They almost seem to act as a kind of team of proteins, restoring cellular functions to a much higher level of youthful effectiveness. Calorie restriction (CR) is so far the only effective way to extend lifespan without genetic or pharmacological intervention. The effects of calorie restriction (besides lifespan extension) are manifested by physiological and behavioral changes, such as reduced body fat, decreased level of growth factors, glucose and triglycerides. The level of almost all sirtuins, except SIRT4, increases as an effect of calorie restriction Therefore, it’s believed that sirtuins help mediate (bring about) beneficial effects elicited by such a diet. SIRT1 is the best studied in the sirtuins family of seven. Scientists think that the declining NAD+ availability as we age decreases SIRT1 in the liver, while simultaneously increasing DNA damage. Age-dependent decrease in the level of SIRT1 is seen also in the arteries, suggesting its involvement in the aging of the cardiovascular system. SIRT2 has been implicated in regulating adipose (fat) tissue development and function. There is less SIRT2 in the fat tissue of obese people and more of it in the white fat tissue and kidneys of mice subjected to calorie restriction. The implication here is that SIRT2 expression is involved in reducing body fat. The other prominent role SIRT2 has is that it can serve as a cellular senescence marker, given that it’s prominent in senescent (zombie) cells, but not in cells that entered apoptosis (dead cells). However, scientists don’t believe that SIRT2 is a factor in causing senescence, but may be an effect of the changes occurring in cells during senescence. SIRT3 is the only sirtuin that current evidence indicates can influence longevity in humans. A certain polymorphism (a genetic variation) in the SIRT3 gene can be found more often in long-lived people. People with less of it are less likely to survive to an old age. Mice lacking SIRT3 are characterized by decreased oxygen consumption and a simultaneous increase in the production of reactive oxygen species (ROS, commonly referred to as “free radicals”), as well as higher oxidative stress in muscle. SIRT4 may act as an oncogene (a gene that can transform a cell into a tumor cell) and tumor suppressor gene, which may be dependent on the affected tissue types and specific tumor environment. SIRT5 can help eliminate of oxidative stress-promoting ammonium, as well as mitigate a buildup of fatty acids in the liver. The first evidence that sirtuins can be involved in regulation of mammalian aging came from mice lacking SIRT6. It appears that among sirtuins, SIRT6 depletion exhibits the most severe phenotype (observable physical characteristics), as it seems to be indispensable for reaching a normal lifespan. Three weeks after birth such mice exhibit symptoms of degeneration and premature aging, such as a sudden decrease in subcutaneous fat, lordokyphosis (swayback spine), colitis (inflammatory bowel disease), severe lymphopenia (too few white blood cells), and osteopenia (thinning bones), which all together result in death in about the fourth week of life. Wioleta Grabowska, et al: Sirtuins, a promising target in slowing down the aging process. Guoyu Huang, et al: Sirtuin-4 (SIRT4), a therapeutic target with oncogenic and tumor-suppressive activity in cancer. Thaddeus T. Schug et al: Surprising sirtuin crosstalk in the heart. Everybody ages, but no one knows exactly why. What we do know is that increased fatigue, weakened bones and ill health walk in lockstep with aging, as does chronic disease. Age is the number one risk factor for many diseases, including Alzheimer’s, cancer, cataracts, and macular degeneration. Researchers are making progress in understanding and treating each of these ailments, and in their understanding of the aging process itself. DNA damage is a big part of the story. And now we know that NMN might help fix damaged DNA. In 2013, a group of Spanish scientists led by Dr. Carlos Lopez-Otin took a crack at identifying and explaining what they referred to as the “Hallmarks of Aging.” They clearly showed that aging is the outcome of diverse and complex changes in normal biological functions, from dysfunction of proteins and altered communication – both within cells and among distant tissues in the body – to the accumulation of DNA damage. In 2017, research led by scientists at Harvard Medical School revealed a critical step in a molecular chain of events that allows cells to fix damaged DNA. This occurred by taking a vitamin supplement called NMN that activated a DNA-repair molecule called NAD+ . Before I review the Harvard study and what its conclusions might mean to your health, let’s examine how DNA damage ages us. As we age, damage accumulates, including mutations and impairments in DNA repair processes. At the cellular level, decreases in the regenerative abilities of stem cells, impairments in mitochondrial function, and a tendency for proteins to misfold can all contribute to aging. In the case of DNA, as it replicates, the cellular machinery involved in the process makes mistakes, leading to changes in the DNA sequence. Mutagens such as reactive oxygen species (ROS or free radicals) or UV radiation can also damage DNA. Most of the time, DNA repair mechanisms fix the damage, but errors slip through and accumulate as we age. Aging has also been linked to the deterioration of DNA repair machinery, allowing permanent errors to become more common in older people. (1) When DNA has become too damaged, cells kill themselves or enter a nonreplicating state, which is called senescence. Though largely dormant, senescent cells may speed the aging process by secreting inflammatory cytokines thought to contribute to atherosclerosis and other aging-related diseases. (2) DNA scaffolding proteins that typically help stabilize the genome (our genetic material) show changes with age, contributing to impaired cell division, increased senescence, and other aging-related processes. (3) Telomeres may be especially prone to DNA damage and lose their ability to protect the body from cancer and protect chromosomes from fusing with one another. Obviously, helping the body repair its DNA damage is a big step to aging more slowly and extending healthspan, if not lifespan. That’s why the findings of the Harvard study are so important. Published March 24, 2017 in Science, the Harvard studyoffers important insights into how and why the body’s ability to fix damaged DNA dwindles over time. It also shows that the signaling molecule NAD+ is a key regulator of protein-to-protein interactions in DNA repair. Experiments conducted on mice show that treatment with the NAD+ precursor NMN mitigates age-related DNA damage and wards off DNA damage from radiation exposure. If affirmed in further animal studies and in humans, the findings can help pave the way to therapies that prevent DNA damage associated with aging. In addition, they may help with cancer treatments that involve radiation exposure and some types of chemotherapy, which along with killing tumors, can cause considerable DNA damage in healthy cells. Dr. Sinclair is a professor in the Department of Genetics at Harvard Medical School, co-director of the Paul F. Glenn Center for the Biology of Aging, and professor at the University of New South Wales School of Medicine in Sydney. Dr. Sinclair obviously believes that the benefits conferred to the mice he studied that consumed NMN will also occur in people. That’s because NMN stimulated NAD+ which in turn boosts the activity of SIRT1. At the outset, the Harvard researchers knew that NAD+ is needed to boost the activity of the SIRT1 protein, which delays aging and extends life in yeast, flies, and mice. The problem is that NAD+ declines steadily in all animals as we age, including us. Given that both SIRT1 and PARP1 (a protein known to control DNA repair) consume NAD+ in order to do their work, less NAD+ means fewer health benefits conferred by SIRT1 and PARP1. A sirtuin is a type of protein involved in regulating cellular processes including the aging and death of cells and their resistance to stress. SIRT1 refers to the first of seven sirtuins that are in mammals. PARP1 is one of a family of proteins involved in a number of cellular processes such as DNA repair, genomic stability, and programmed cell death. SIRT1 and PARP1 are big players in maintaining a mammal’s vitality, but as mentioned, both of these proteins require NAD+ to function. To increase NAD+ levels, the researchers treated young and old mice with the NAD+ precursor NMN, which makes up half of an NAD+ molecule. NAD+ is too large to cross the cell membrane, but NMN can slip across it easily. Once inside the cell, NMN binds to another NMN molecule to form NAD+. As expected, old mice had lower levels of NAD+ in their livers, lower levels of PARP1. After receiving NMN with their drinking water for a week, however, old mice showed marked differences both in NAD+ levels and PARP1 activity. NAD levels in the livers of old mice shot up to levels similar to those seen in younger mice. The cells of mice treated with NMN also showed increased PARP1 activity. Overall, the mice showed a decline in molecular markers that signal DNA damage. In a final step, the Harvard scientists exposed mice to DNA-damaging radiation. Cells of animals pre-treated with NMN showed lower levels of DNA damage.Such mice also didn’t exhibit the typical radiation-induced aberrations in blood counts, such as altered white cell counts and changes in lymphocyte and hemoglobin levels. The protective effect was seen even in mice treated with NMN after radiation exposure. Taken together, the results shed light on the mechanism behind cellular demise induced by DNA damage. They also suggest that restoring NAD levels by NMN treatment should be explored further as a possible therapy to avert the unwanted side effects of environmental radiation, as well as radiation exposure from cancer treatments. In the modern era, you have an excellent chance of reaching your 60s, 70s and beyond. At the same time, you also have an excellent chance of getting one or more chronic diseases associated with old age, because aging is a major risk factor for disease. As we grow older, the chances of contracting virtually every chronic disease increase quickly. High cholesterol tends to increase with age – it’s a risk factor for heart attack and stroke. Blood sugar tends to increase with age – it’s a risk factor for type 2 diabetes, also instigated by body fat, which positively correlates with age. Rather than increase as we get older, our muscles wither, a condition known as sarcopenia. Arguably, aging is the most dominant cause of chronic disease, and yet it’s not being managed. Doctors don’t sit on their hands until you have a heart attack or a stroke – they notice that you have high cholesterol and manage that cholesterol. Likewise, they don’t wait until you have kidney damage caused by diabetes (diabetic nephropathy) – they manage the hyperglycemia. But no one monitors the aging process directly, nor advocates for preventative protocols that could slow down how fast we age. What we need to do is manage the rate of aging to be able to prevent disease and maintain our physiological and cognitive functionality longer. One way to do that is to activate the cellular signaling pathwaysthat are involved in promoting the only proven method to enhance longevity and healthspan – calorie restriction. As you’ll soon see, Nicotinamide Mononucleotide (NMN) is such an activator. But first let’s get some understanding about how it works by mimicking the life-sustaining benefits of caloric restriction. CR has been studied extensively in yeast, worms, mice, monkeys and even humans. In a laboratory you can control the caloric consumption of animals during their lifetime, but humans are too long lived and none would appreciate living their life in a lab. Left unaided by scientists, the long term adherence to a CR dietary regimen for a human is extremely difficult for most to maintain, but some people do. Why are the Japanese typically the longest lived humans? Fewer calories. The good news is that you might be able to improve your healthspan, and possibly lifespan, without reducing your calories by 20%, but by activating the same cellular pathways that caloric restriction does. The solution to experiencing the benefits of long-term CR would be to identify and use compounds which act as “CR mimetics” (6). Over the past 20 years, scientists have made great strides in understanding the key cellular components involved in mediating many of the metabolic changes that contribute to the aging process. They have discovered how certain compounds are capable of inducing similar cellular changes that are normally seen during CR. In their investigation about how CR can improve longevity, scientists discovered a “molecular switch” that is flipped in response to a nutritional deficit. It’s been found in a family of protein molecules known as sirtuins. Mammals have seven sirtuins, and collectively they are among the important modifiers for lifespan. One way CR slows down the aging process is by reversing the age-related decline of bioavailable NAD+. This key metabolite plays a crucial role in regulating the activity of many important signaling molecules involved in age-related diseases. So, given that NAD+ is essential to longevity, but declines as we age, how do you boost it? The answer is that you must activate its production indirectly. Feeding or administering NAD+ directly into the body is impractical, because the NAD+ molecule cannot readily cross cell membranesto enter cells, and therefore would be unavailable to positively affect metabolism. Instead, precursor molecules to NAD+ – such as NMN – must be used to increase bioavailable levels of NAD+. In a study published in 2013, Ana P. Gomes, PhD. and her collaborators showed that by administering the NAD+ precursor NMN (Nicotinamide Mononucleotide) in normal drinking water to older mice, NAD+ levels were restored to those normally associated with younger healthy animals. Old mice fed Nicotinamide Mononucleotide for just one week experienced a restoration in muscle mitochondrial function to levels seen in younger mice. Mitochondria are cellular organelles that function as power plants within a cell. In the same way that a local power plant produces electricity for an entire city, mitochondria are responsible for the production of energy derived from the breakdown of carbohydrates and fatty acids. Mitochondria oxidize or “burn” carbohydrates, amino acids and fatty acids for energy, yielding ATP. ATP is the cellular form of energy utilized by cellular processes all throughout the body, providing the energy to pump your heart, power neurons in your brain, contract muscles in your limbs, exchange gases in your lungs, extract nutrients from food and regulate body temperature, to name just a few. In order to provide the massive amounts of ATP needed for movement and exercise, your muscles contain the highest mitochondrial content of any tissue in your body, which is why the finding that NMN restores youthful mitochondrial function in muscle was so important. NMN is well-tolerated without any obvious harmful effects. NMN suppresses age-associated body weight gain and enhances energy metabolism. NMN improves insulin sensitivity, eye function, and other features with no toxicity. NMN prevents age-associated gene expression changes in a tissue-specific manner. NMN is an effective anti-aging intervention that could be translated to humans. In the 2016 study, researchers confirmed that NMN entered the bloodstream within 2.5 minutes of oral consumption and increases in NAD+ levels were observed in the liver, skeletal muscle, and cortex of the brain. In addition, they found that the NMN synthesized NAD+ in tissues of the liver and soleus muscle. These results suggest that orally administered NMN is quickly absorbed, efficiently transported into blood circulation, and immediately converted to NAD+ in major metabolic tissues. The average numbers of percent body weight reduction in NMN-fed mice was dose-dependent, and was between 4% and 9% less, depending on the amount of NMN ingested, than the control group that was not fed NMN. At 12 months, the higher dose NMN group had a decreased fat mass and an increased lean mass compared to controls – meaning that they were both less fat and more muscular. Significantly decreased respiratory quotient, suggesting that NMN-fed mice switched their main energy source from glucose to fatty acids. Taken together, these results strongly suggest that NMN has significant preventive effects against age-associated impairment in energy metabolism. NMN-fed mice showed significantly improved insulin sensitivity compared to the control group consisting of body weight-matched individuals. Consistent with this improved insulin sensitivity, triglyceride levels (body fat stores) – a surrogate of insulin resistance – were lower in NMN-fed mice. As we age, typically insulin sensitivity declines, fasting and average blood glucose levels increases and we gain weight; however the results of this mouse study suggest that long-term NMN consumption can ameliorate age-associated decline in insulin sensitivity, independent of its effect on body weight. Moreover, the NMN-fed mice experienced less age-associated increases in adipose tissue (body fat) inflammation, a hallmark of obesity and insulin resistance. NMN prevented the decline in rod cell function in aged NMN-fed mice. Rod cells are photoreceptor cells in the retina of the eye that can function in less intense light than the other type of visual photoreceptor, called cone cells. In addition to these effects of NMN on eye function, the researchers detected small but significant increases in bone density in the NMN-fed mice. To date, no studies on the ability of NMN to increase NAD+ levels in humans have been published. That’s not to say that such a study hasn’t actually been done. An international collaborative team between Keio University School of Medicine in Tokyo and Washington University School of Medicine in St Louis has started the Phase I human clinical study for NMN to assess the safety and the bioavailability of NMN in humans. NAD precursors and sirtuin activators are attracting significant attention owing to the vast amount of data accumulated in the last 16 years since the discovery of the NAD+ and sirtuin interaction. Although NAD+ itself is difficult to administer directly to humans, its precursors – NR (nicotinamide riboside) and NMN (nicotinamide mononucleotide) – are promising natural compounds with which to augment NAD levels in the cells and the body. This phase I study is not planned for a pharmaceutical development, but for a nutraceutical (vitamin) development. Although we don’t know yet the specific outcome of the human trial begun in 2016, it seems apparent from Shinkowa’s actions that they were favorable. Office for National Statistics: How has life expectancy changed over time? NCBI – Pubmed.gov: Calorie restriction mimetics: can you have your cake and eat it, too? By age 50, people have about half as much NAD+ in their bodies as they did at age 20. Scientists have linked low levels of NAD+ with several chronic diseases, such as multiple sclerosis, Alzheimer’s and cardiovascular disease. NAD+ is short for “nicotinamide adenine dinucleotide,” and you can’t live without it. This coenzyme is required for the fundamental biological processes that make your life possible. A coenzyme is a compound that’s necessary for an enzyme to do its job as a catalyst to bring about a biochemical reaction. NAD+ is such a compound. It’s found in every cell in your body and is needed to regulate how quickly your cells age. A fascinating aspect of NAD+ is its dual role in protecting against factors that age us. This includes mitigating chemical stress, inflammation, DNA damage, and failing mitochondria. So, why don’t we just consume the NAD+ molecule? Because NAD+ cannot pass through the plasma membrane. It needs a precursor that can boost NAD+ once entering the cell. NR (nicotinamide riboside) and NMN (nicotinamide mononucleotide) are the two most common and studied precursors. Of these, the sublingual form of NMN, such as Prohealth’s NMN Pro, is preferable given its enhanced bioavailability. NAD+ is involved in a multitude of cellular repair processes in our bodies, mainly by activating sirtuins, a family of proteins responsible for a wide range of cellular processes like aging, transcription, apoptosis, inflammation and stress resistance, as well as energy efficiency and alertness during low-calorie situations. Sirtuins can also control circadian clocks and mitochondrial biogenesis. As we age, the decline in NAD+ levels causes these critical cellular processes to become less effective, resulting in the cascade of multiple biochemical and physiological effects we call aging. As a helper molecule for proteins that regulate other crucial biological activity. These processes are incredibly important because they are responsible for regulating oxidative stress and circadian rhythms while maintaining the health of DNA and keeping you healthier, longer. A plethora of scientific studies have recently focused on NAD+ due to its central role in many essential biological functions, with research in animals tying NAD+ to exceptional benefits, including for us humans. These are only some of the recent findings, and they’re sufficiently inspiring for scientists to continue their NAD+ research, including on humans. The reason is simple – increasing NAD+ levels may be a sure-fire way to improve healthy aging. David A. Sinclair: Can NMN Increase Longevity? Science Daily: Natural compound reduces signs of aging in healthy mice. Brady Hartman: Can These Revolutionary Technologies Beat Aging In Our Lifetime? Dongryeol Ryu, et al: NAD+ repletion improves muscle function in muscular dystrophy and counters global PARylation. Jun Li, et al: A conserved NAD+ binding pocket that regulates protein-protein interactions during aging. Hou Y, et al: NAD+ supplementation normalizes key Alzheimer’s features and DNA damage responses in a new AD mouse model with introduced DNA repair deficiency. Ryan W. Dellinger, et al: Aging and Mechanism of Disease. We believe in order to live a long and healthy life, you must build the right lifestyle habits. And we believe that science-backed supplementation is an important part of that longevity lifestyle. Science tells us that aging occurs when our body’s repair mechanisms don’t keep up with the damage that accumulates over time. You don’t need to be a scientist to know that this is true. And as you’ve also undoubtedly noticed, some of us age more slowly, live longer and have more vitality than others. These life-enhancing qualities exhibited in the Blue Zone can be adopted by us, and magnified by supplementation, as you’ll see in some examples I’ll share below. One of the most exciting examples of a supplement that can magnify the benefits of your positive lifestyle habits and virtually turn back the clock on aging is NMN (Nicotinamide Mononucleotide). NMN acts as a precursor to boost the body’s NAD+ levels. Why is that important? Because NAD+ (nicotinamide adenine dinucleotide), a coenzyme found in all living cells, is essential for the fundamental biological processes that make life possible. Unfortunately, NAD+ levels decline as we get older. By the age of 50, our NAD+ levels have already dropped by 50% and will continue a steady decline throughout the rest of our lives. Fortunately, though, that’s not the end of the story. Thanks to the research of Dr. David Sinclair, a Professor in the Department of Genetics at Harvard Medical School and Co-director of the Paul F. Glenn Center for the Biological Mechanisms of Aging, we now know that NAD+ can be boosted to youthful levels by administering its precursor – NMN. Before beginning NMN, 47-year-old Sinclair had his blood tested and was told his body had a biological age of 58. After consuming 500 mg of NMN every day for three months, he was tested again and his biological age was 32. When Sinclair’s mother had her left lung removed, he was told by her doctors that her remaining life expectancy was about a year. Sinclair was not accepting that. He prescribed his mother NMN, and she lived for 20 more years. Taking NMN has reduced Sinclair’s 77-year-old father’s apparent age by about two or three decades, and he has successfully taken up mountaineering. Sinclair’s younger brother was so affected by being outpaced by his 77-year-old father that he, too, is now taking NMN. As we get older, our telomeres shorten. Telomere length is representative of biological age – the age your body thinks it is – as opposed to what the calendar suggests. 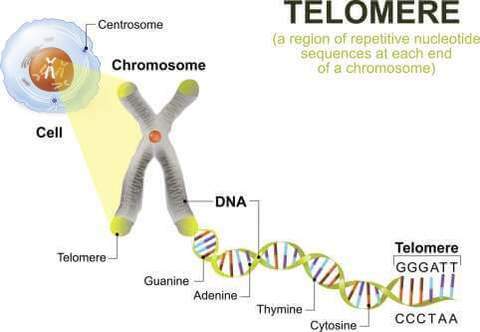 The shorter your telomeres, the older is your body. Dr. Blackburn’s research shows that chronic stress disrupts the ability of the enzyme telomerase to help keep telomeres long. If you’re stressed too much for too long, you become older, quicker. The telomere example underscores the value of choosing the right lifestyle habits, because if you take the time to become mindful of the events that stress you and take actions to mitigate them, then you’re taking an active and positive step to improve your healthspan. In this case, you could meditate and take stress-reducing adaptogens, such as as Ashwagandha and GABA (gamma-aminobutyric acid), the number one inhibitory (calming) neurotransmitter in the brain. So, yes, we believe supplements make a difference if they’re backed by scientific research. If properly selected, some supplements can help improve our repair mechanisms and/or reduce the damage that accumulates as we age. Take cardiovascular disease, for example, the number one killer worldwide. A 2015 study showed that certain natural compounds contain the healing properties that may play a preventative role in many of the diseases plaguing us, particularly as we get older. These natural compounds are plentiful in our Green Tea EGCG Extreme™, Pterostilbene Supreme and Natural Resveratrol. These are all examples taken from scientific studies that show certain supplements can amplify the benefits of lifestyle habits we adopt to extend our healthspan, and perhaps our lifespan as well. We just need to cross the bridge. The second and third bridges have not yet been built. They are waiting for the necessary longevity biotechnology that can actually repair DNA and reverse chronic disease to be invented and tested. But the first bridge is right in front of you. You can cross it now. Bridge #1 is constructed of the lifestyle habits you make to reduce your chances of getting a chronic disease that will eventually kill you. Because, remember, you don’t die because of old age, but because of disease – the deterioration of some biosystem that can no longer support life. I hope you now have a better understanding of how and why we believe that the right supplements, supported by scientific research, and coupled with healthy lifestyle choices can help you cross that first bridge to greater health, vitality and longevity. 1. Joe Garma: Want 10 Extra Years? It’s Easier Than You Think In The Blue Zones. 2. George Tait Edwards: How To Live A Healthy Long Life. 3. Kathryn F. Mills, et al: Long-Term Administration of Nicotinamide Mononucleotide Mitigates Age-Associated Physiological Decline in Mice. 4. The Milken Institute Center for the Future of Aging: The Habits That Can Help You Live Longer. 5. Maureen Callahan: Fifty-something Diet: Boosting Your Longevity Odds. 6. Ruscica, et al: Nutraceutical approach for the management of cardiovascular risk – a combination containing the probiotic Bifidobacterium longum BB536 and red yeast rice extract: results from a randomized, double-blind, placebo-controlled study. 7. Joseph Shay, et al: Molecular Mechanisms and Therapeutic Effects of (−)-Epicatechin and Other Polyphenols in Cancer, Inflammation, Diabetes, and Neurodegeneration. 8. Joe Garma: Ray Kurzweil’s March To Extend Life. Unfortunately, our NAD+ levels drop as we age. One reason is that a compound called CD-38 destroys NAD+. This is a good thing if done modestly, because CD-38 keeps our NAD+ from getting too high and impinging on important biochemical processes, such as sleep-wake and hunger cycles. But as we get older, CD-38 gets too ambitious and destroys too much NAD+. The balance is upended, resulting in too much CD-38, and not enough NAD+. Inside the nucleus of a cell, our genes are arranged along twisted, double-stranded molecules of DNA called chromosomes. At the ends of the chromosomes are stretches of DNA called telomeres, which protect our genetic data, make it possible for cells to divide, and hold some secrets to how we age. Each time a cell divides, the telomeres get shorter. When they get too short, the cell can no longer divide; it becomes inactive (senescent) or it dies (apoptosis). This telomere shortening process is associated with aging, cancer, and a higher risk of death. NAD+ is required for functioning of the sirtuin proteins that help maintain the length of telomeres. As we age, our immune cells become inconsistent––some become overactive (which can contribute to autoimmune disease) and others slow down (which increases the risk of infection). This process, called immunosenescence, is intimately related to mitochondrial function and energy balance, both of which depend on NAD+ activity. Thus, adequate intracellular NAD+ is vital for youthful cellular energy, a critically important factor in fending off immunosenescence and maintaining defenses against infections and autoimmune disease. Our chromosomes are complex structures housing our DNA. Think of it this way: DNAis in genes; genes are on chromosomes. Access to DNA strands for “reading out” genetic instructions requires biochemical control of those proteins to make sure each gene functions properly, but like any complex molecular structure, chromosomes can become unstable. Eventually, instability triggers errors in how genes are interpreted, which ultimately contribute to harmful changes in cell function and structure. Aging is accelerated in the presence of increased chromosome instability.(14)(15)(16). Neurotransmitters are brain chemicals that relay signals between nerve cells, and thereby help regulate body-wide functions such as mood, appetite, and stress. Supporting efficient energy production and adequate ATP levels requires consistent and abundant NAD+. This is critical because as our cellular energy diminishes, so does our life force. The bottom line is that NAD+ is needed for sirtuins to function. Courtney Sperlazza: Is NAD+ the Anti-aging Miracle Pill? Here’s What the Science Says. Shin-ichiro Imai, et al: NAD+ and Sirtuins in Aging and Disease. Jackson SP, Bartek J. The DNA-damage response in human biology and disease. Nature.2009;461(7267):1071-8. Ying W, Garnier P, Swanson RA. NAD+repletion prevents PARP-1-induced glycolytic blockade and cell death in cultured mouse astrocytes. Biochem Biophys Res Commun.2003;308(4):809-13. Burkle A, Beneke S, Muiras ML. Poly(ADP-ribosyl)ation and aging. Exp Gerontol.2004;39(11-12):1599-601. Wang S, Xing Z, Vosler PS, et al. Cellular NAD replenishment confers marked neuroprotection against ischemic cell death: role of enhanced DNA repair. Stroke.2008;39(9):2587-95. Pittelli M, Felici R, Pitozzi V, et al. Pharmacological effects of exogenous NAD on mitochondrial bioenergetics, DNA repair, and apoptosis. Mol Pharmacol.2011;80(6):1136-46. Fang EF, Kassahun H, Croteau DL, et al. NAD+Replenishment Improves Lifespan and Healthspan in Ataxia Telangiectasia Models via Mitophagy and DNA Repair. Cell Metab.2016;24(4):566-81. Paul May, Bristol University: Adenosine Triphosphate (ATP). Ritov VB, Menshikova EV, Azuma K, et al. Deficiency of electron transport chain in human skeletal muscle mitochondria in type 2 diabetes mellitus and obesity. Am J Physiol Endocrinol Metab.2010;298(1):E49-58. Shum LC, White NS, Nadtochiy SM, et al. Cyclophilin D Knock-Out Mice Show Enhanced Resistance to Osteoporosis and to Metabolic Changes Observed in Aging Bone. PLoS One.2016;11(5):e0155709. Canto C, Houtkooper RH, Pirinen E, et al. The NAD(+) precursor nicotinamide riboside enhances oxidative metabolism and protects against high-fat diet-induced obesity. Cell Metab.2012;15(6):838-47. Mills KF, Yoshida S, Stein LR, et al. Long-Term Administration of Nicotinamide Mononucleotide Mitigates Age-Associated Physiological Decline in Mice. Cell Metab.2016;24(6):795-806. Chen M, Huang JD, Deng HK, et al. Overexpression of eIF-5A2 in mice causes accelerated organismal aging by increasing chromosome instability. BMC Cancer.2011;11:199. Lushnikova T, Bouska A, Odvody J, et al. Aging mice have increased chromosome instability that is exacerbated by elevated Mdm2 expression. Oncogene.2011;30(46):4622-31. Rao CV, Asch AS, Yamada HY. Emerging links among Chromosome Instability (CIN), cancer, and aging. Mol Carcinog.2017;56(3):791-803. Fatoba ST, Okorokov AL. Human SIRT1 associates with mitotic chromatin and contributes to chromosomal condensation. Cell Cycle. 2011;10(14):2317-22. Mutafova-Yambolieva VN. Neuronal and extraneuronal release of ATP and NAD(+) in smooth muscle. IUBMB Life. 2012;64(10):817-24. Watroba M, Dudek I, Skoda M, et al. Sirtuins, epigenetics and longevity. Ageing Res Rev. 2017;40:11-9. Scitable: Cell Energy and Cell Functions. Oka S, Hsu CP, Sadoshima J. Regulation of cell survival and death by pyridine nucleotides. Circ Res. 2012;111(5):611-27. Rowlands BD, Lau CL, Ryall JG, et al. Silent information regulator 1 modulator resveratrol increases brain lactate production and inhibits mitochondrial metabolism, whereas SRT1720 increases oxidative metabolism. J Neurosci Res. 2015;93(7):1147-56. Hung CH, Chan SH, Chu PM, et al. Quercetin is a potent anti-atherosclerotic compound by activation of SIRT1 signaling under oxLDL stimulation. Mol Nutr Food Res. 2015;59(10):1905-17. Xiao N, Mei F, Sun Y, et al. Quercetin, luteolin, and epigallocatechin gallate promote glucose disposal in adipocytes with regulation of AMP-activated kinase and/or sirtuin 1 activity. Planta Med. 2014;80(12):993-1000. You cannot enjoy robust health if your body doesn’t manufacture energy. Unfortunately, as we age, we gradually become increasingly less energetic simply because our bodies produce less of it. NMN may be a way to cheat Father Time. In skeletal muscle, the investigators discovered that NMN administration helps energy metabolism by improving the function of mitochondria, which operate as cellular power plants. Developed improved insulin sensitivity, and this improvement remained significant even when they corrected for differences in body weight. The remarkable things that NMN can do to improve your health and help you age better is due to its ability to boost NAD+, and that best happens when the NMN can actually enter your bloodstream. As you’ll see in the next section, NAD+ (nicotinamide adenine dinucleotide) is a coenzyme found in all living cells, and is necessary for the fundamental biological processes that make life possible. NAD+ has two general sets of reactions in the human body: helping turn nutrients into energy as a key player in metabolism and working as a helper molecule for proteins that regulate other biological activity. These processes are incredibly important because they are responsible for regulating oxidative stress and circadian rhythms while maintaining the health of DNA and keeping humans healthier for longer. Unfortunately, NAD+ levels decline as we age, and we simply can’t consume this molecule directly to make up for its decline in our body. That’s why we need to take an NMN sublingual precursor to NAD+ that will boost its levels. Vascular aging causes many diseases – cardiovascular, neurological, muscle wasting, frailty, and even aging. As we age, the smallest blood vessels in our bodies wither and die, reducing the blood flow to organs and tissues. Harvard professor, Dr. David Sinclair’s experiments with mice have demonstrated a way to reverse blood vessel aging and grow muscle. Old blood vessels become deaf to the signals from exercise muscles, which results in muscles shrinking as we age and a diminished capacity to exercise and grow new blood vessels. This muscle tissue loss and weakness that happens as we grow older is a condition called sarcopenia. Physically inactive people can lose as much as 3% to 5% of their muscle mass each decade after age 30. Cognizant of the effects of sarcopenia, Dr. Sinclair and his research associates decided to examine why exercise loses its protective power to sustain muscle vitality and whether this process is reversible. The signaling crosstalk between blood vessels and muscles requires NAD+ and sirtuin1, or SIRT1. NAD+ boosts SIRT1, which in turn enables the signaling conversation between muscles and blood vessels. The problem is that both NAD+ and SIRT1 decline as we age and eventually can no longer perform their role as the interface between muscles and blood vessels. In Dr. Sinclair’s study, mice were given NMN which boosted NAD+ levels and in turn boosted SIRT1. The results were that these mice had better endothelial function, blood vessel growth and improved blood supply to their muscles. Weight gain and weight loss resistance are common struggles for countless people across the world. NMN is a powerful nutraceutical ally in weight loss efforts because it reverses insulin resistance, improves glucose tolerance, and ameliorates mitochondrial dysfunction, three factors that contribute to stubborn weight issues. In Dr. Imail’s study, mice fed low-dose NMN lost 4% of their body weight. Those fed high-dose NMN lost 9% of their body weight. The mitochondria are the energy power plants of cells. In Dr. Imai’s study, mice given NMN were much more energetic and had better energy production from their mitochondria. The human heart requires a continuous supply of ATP to fuel its muscular contractions and sustain life. ATP is short for Adenosine Triphosphate, a molecule known in biochemistry as the “molecular currency” of intracellular energy transfer; meaning that ATP stores and transports chemical energy within cells. Without ATP we would soon die, but that doesn’t happen. What does happen is Interruptions in the heart’s ATP supply, which can impair cardiac and vascular function and contribute to the development of cardiovascular disease. Alzheimer’s is a chronic neurodegenerative disease that usually starts slowly and worsens over time. It is the cause of 60 to 70% of cases of dementia. The most common early symptom is difficulty in remembering recent events or newly learned information (short-term memory loss). The exact causes of Alzheimer’s disease aren’t fully understood, but at its core are problems with brain proteins that fail to function normally, disrupt the work of brain cells (neurons) and unleash a series of toxic events. Neurons are damaged, lose connections to each other and eventually die. The damage most often starts in the region of the brain that controls memory, but the process begins years before the first symptoms. The loss of neurons spreads in a somewhat predictable pattern to other regions of the brains. By the late stage of the disease, the brain has shrunk significantly. Ling Liu: Quantitative Analysis of Redox Metabolism. Neha Narang, Jyoti Sharma: Sublingual Mucosa As A Route For Systemic Drug Delivery. Healthline: Xylitol, Everything You Need to Know. Alice Park: How This Broccoli Enzyme Can Slow Aging. Shin-ichiro Imai, et al: Long-Term Administration of Nicotinamide Mononucleotide Mitigates Age-Associated Physiological Decline in Mice. Antonio Lucena-Cacace, et a: Nicotinamide phosphoribosyltransferase: Biology, role in cancer, and novel drug target. Yamamoto T, et al: Nicotinamide mononucleotide, an intermediate of NAD+ synthesis, protects the heart from ischemia and reperfusion. Yao Z, et al: Nicotinamide mononucleotide inhibits JNK activation to reverse Alzheimer disease.